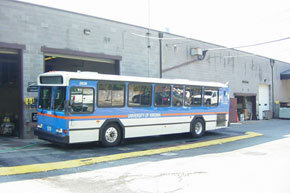 UVA Parking and Transportation operates a bus maintenance facility, which requires an industrial stormwater discharge permit under the Virginia Pollutant Discharge Elimination System (VPDES) program. VPDES requres of the monitoring of stormwater discharges and the development of a Stormwater Pollution Prevention Plan (SWPPP) from industrial facilities. In order to comply with this program, a SWPPP was created for the University’s Parking and Transportation Facility on Millmont Street. All drains inside the vehicle maintenance buildings and bus washing areas drain to the sanitary sewer via an oil water separator. The oil water separator treats the water on site before sending the water to the water treatment plant for further treatment. An oil water separator is also installed in the drain in the bus parking area. This oil water separator removes any oil that may have dripped from the busses when not in service. The separator then discharges the clean water to the storm sewer. An oil water separator has also been installed to treat all runoff from the parking lot behind the building while a BaySaver treats runoff from the bus parking area. The BaySaver is installed underground at the end of the bus parking area at UVa Parking and Transportation. The BaySaver is comprised of two manholes, a primary manhole and a storage manhole. The primary manhole, seen on the right, is attached to the storm drain and serves to collect large sediment. After passing through the primary manhole, the water flows over a weir plate, which regulates flow to the storage manhole. The storage manhole on the left is the secondary treatment device. Oil and floating debris float on the top of the water, while fine sediment settles to the bottom. Clean water is then discharged from the storage manhole to the outfall. In addition to the oil water separators, secondary containment devices such as berms around fueling areas and storage containers are in place to contain any spill. Recently, canopies were installed over the vehicle fueling areas to prevent rain from washing away any fuel drips or spills. These containment devices, known as Best Management Practices (BMPs), are in place to provide multiple levels of protection from stormwater pollution. UVA Parking and Transportation has a separate permit for stormwater discharges associated with industrial activity.